The name of Summit Township was suggested by Wesley Taylor, from the fact that the ridge forming the watershed between the Mississippi and Missouri Rivers passes through this township from southeast to northwest. Middle River has a branch which has its source within the limits of this township, on sections 3 and 10, and flows in a southeasterly direction toward the main stream. The Middle Nodaway River takes its rise in sections 11 and 14, and flowing southwesterly, crosses sections 15, 22, 21, 28, 29, 32, and 31, passes into Eureka Township on the south line of the latter section. Several other branches of this stream also drain the south part of this subdivision. Turkey Creek, rising in the northern central part of the township, waters with its main stream and tributaries, sections 4, 5, 6, 7, 8, 9, 17 and 18. Timber has never been very plentiful in this township. The soil is rich in most places. Azariah Sisson and his son, William A., who came here in June, 1869, were undoubtedly the first settlers in Summit Township. They made a settlement on the north half of Section 16. William A. Sisson was train dispatcher for the Chicago, Rock Island & Pacific Railroad at Atlantic for about two years. Azariah Sisson was born in Rensselaer County, New York, on September 16, 1822. The next settler was Abner Sisson, a brother of Azariah. He came here from Bureau County, Ill., in 1869, and located upon the southwest quarter of section 17. This place he afterwards sold and bought the southwest quarter of Section 27. He devoted most of his life to farming and stock raising. Elmer, one of their children was killed by a runaway team. Next came John Chestnut, Sr. In 1870 he made a settlement on the south half of section 16 and later moved to the southeast quarter of the same section. He was a native of Virginia. Aurel Albee came to this vicinity in 1870. He came from Bureau County, Ill., and bought 600 acres of land and located upon the south half of Section 9. About the year 1877 he moved to California, where he died in 1883. E. M. Day was a settler of the year 1870 and owned a small building on the farm of Azariah Sisson, where he taught school in the summer of the same year. In the autumn of 1870 Richard and William Lynam settled upon the northwest quarter of section 20. They came to this county from Galva, Ill., but only stayed here for a short time. A. M. Todd came here in 1871 and located upon the southwest quarter of section 19. He remained here for a year and a half. Among the early settlers of the years 1870 and 1871 were: Robert Grant, C. Enright and several others. Grant was a native of Ireland and emigrated to America when thirteen years of age. He lived in New York and Illinois prior to coming to Adair County. In 1870 he came to this county, and here lived until 1875, when he went to Eureka Township and improved a quarter section. In the spring of 1872 Andrew and David Kingery came to the southwest quarter of section 16. They came from Lanark, Ill.
Samuel Knisely came to the township in 1880; Leroy Curtis came in 1874; John Kauffman in 1869; Alvin Thayer in 1875; James M. Johnson in 1881 and Frank Hern in 1875. The first marriage in the township was that of Henry H. Blakesley and Mattie L. Sisson, on February 5, 1873. The ceremony was performed by Elder C. P. West at the house of the bride's father, Azariah Sisson. The first death in the township was that of George, son of Richard Lynam. The second death was that of Elmer F. Sisson, son of Abner Sisson. Summit Township was set off from Walnut, to which it had been attached in 1871. A petition to that effect was presented to the board of supervisors of Adair County on March 11th of that year, signed by the following persons: W. A. Sisson, Azariah Sisson, DeKalb Chestnut, A. Albee, Abner Sisson, William Lynam, John Chestnut, J. W. Chestnut, Robert Grant, C. Enright, R. H. Lynam, And R. J. Foster. In response the board granted the petition and designated the schoolhouse on section 17 as the place of holding the first election, and appointed Abner Sisson as the organizing officer. Accordingly, in October, at the general election, the following officers were chosen: John Chestnut and Aurel Albee, trustees; Azariah Sisson, justice; John W. Chestnut, clerk; John Chestnut, Sr., assessor. 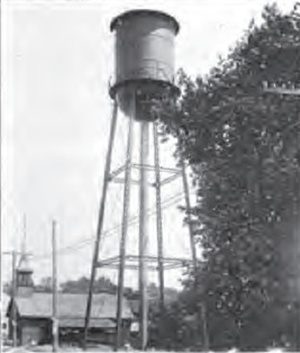 The point at which the Town of Adair is located was chosen on account of it being the highest point on the Chicago, Rock Island and Pacific Railroad when the latter was projected through the county. It was laid out on land belonging to George C. Tallman, of Brooklyn, New York, during the summer of 1872, and the name of Adair given to it. The plat of the town was filed for record in the office of the county recorder on August 20, 1872. The Tallman land, where the town was first laid out, on section 4, was not used to any extent for several years. The business portion of the town started on section 3, which is now the business section. The Tallman plat was called West Adair and was composed principally of residences. Nothing was done toward building the town, however, until the following summer, when the railroad put in a station and Charles Stuart constructed a lumberyard. Since that time the town has had a very comfortable growth. The census in 1873 showed a census of 18 people, and in the next year this had increased to 84, and to 150 in 1875. The present population of Adair is fixed at 1,012, census 1915. 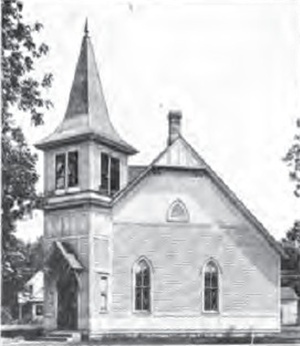 The first dwelling house in the town was erected in the summer of 1873 by Levi Clay in West Adair. The following autumn D. E. Bancroft and John Henryson each built dwellings and in the winter H. P. Starr built. James Miller erected a small house opposite that of Starr in the same year. The first store in the town was established by Moody & Moran of Casey in the early fall of 1873, in a building which they erected for the purpose and which was among the first buildings in the village. In 1874 the interest of S. B. Moody was purchased by James A. Parker and the firm name changed to that of Moran & Parker. This continued until 1879 when Moran bought out his partner and ran the business alone until 1882, when M. L. McManus became a partner. The next dealer in the line of general merchandise was V. M. Lahman. In 1874 Frank Arnold put up a building which was immediately rented by Mr. Lahman, who put in a stock of goods. After remaining in this for about a year he moved to Wiota. In 1875, just after his removal, Wilson & Patton rented the same building and put in a stock of the same line and continued until 1876, when Wilson purchased the interest of his partner and took in John Hunter. These men ran the establishment until 1878, when it was bought out by F. Furst. On January 1, 1879, George Faga & Company commenced business at this point, opening a store for the sale of general merchandise. The pioneer dealer in agricultural machinery was J. A. Ramsdell, who commenced business in 1874. John Jackson began his career as agricultural implement dealer in Adair in 1881, in a building which he erected for the purpose. D. W. Moss constructed a building and placed therein a drug stock, which he sold until 1881, when he traded it to F. L. Gordinier for a quarter section of land and then moved to Kansas. The new proprietor continued in the business until he sold out to Dr. M. F. Stults. In June, 1877, Moss & Baldwin opened another drug store, which they later sold to Locker & Porter, who operated it until 1880, when they disposed of the store to Fayette Parsons. Charles Stuart shipped a quantity of lumber here in the fall of 1972 and started a yard which he placed in the control of H. P. Starr. F. D. Arnold entered the grain and lumber business at Adair in 1873 in company with Capt. Charles Stuart. W. R. Turner began the lumber business in 1876. Frank McFarland began the same business in1873. 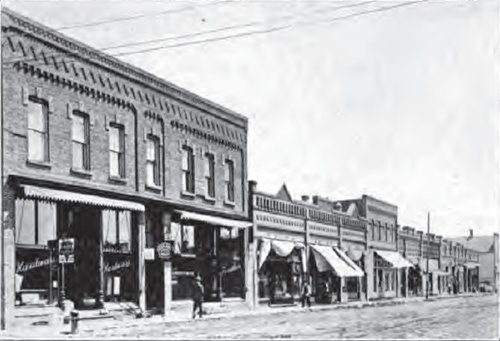 The pioneer jewelry store was established in 1882 by G. W. Henkle, who put in a stock in a building on the south side of Main Street. He afterwards moved to another building a little west of this and took Warren Swart in as a partner. 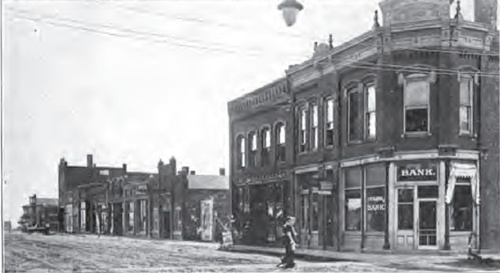 The pioneer milliners of Adair were Misses Donahey and Moss, who opened an establishment in 1876 in the drug store of Doctor Parsons, but closed out after running one season. The first shoemaker of Adair was J. H. Henryson, who came to the village in 1874 and worked at his trade in his dwelling house. He afterwards constructed a small building. Here he continued in business until 1878, when he disposed of the building, and became a salesman in the store of F. Furst. A harness shop was opened by Charles Camper in 1879 in a building which he erected for the purpose. The first blacksmith shop in the village was run by J. A. Beebe, who came to Adair in June, 1874, and opened in a building which he built at the foot of Main Street. The pioneer physician was F. D. Longher, who settled in Adair in 1875. The bank of Adair, a private establishment, was organized in July, 1882, by G. H. Whitmore. Whitmore was a native of Ashtabula County, Ohio. A. C. Savage also had a private bank about the same time called the Farmers Bank. The Exchange Bank, a private institution, was started about the year 1879. The bank was housed in a frame building and was run in conjunction with a general store where the Kelsey & Wagner general store is now located. The store was sold in 1888 and in 1891 a brick building was constructed and is now in use by the bank. F. Furst is the president; M. C. Furst, cashier; C. Rochholz, assistant cashier; and Vera E. Wark, bookkeeper. The responsibilities of the company are fixed at about the sum of $150,000. The First National Bank was started in 1903 as the Savings Bank. W. R. Turner was the president of the Savings and M. R. Porter was casher. The building was purchased of G. H. Whitmore, who had operated a private bank as mentioned above. This bank was in the building now occupied by Lynch & Byers' law office. On November 16, 1905, new interests took hold of the Savings Bank and ran it as the same for 1½ years. In 1907 it was changed to the First National Bank and the following were the first officers: M. H. Welton, president; M. L. McManus, vice president; Roy R. Welton, cashier; J. F. McManus, assistant cashier. These officers are the same now with the exception of Thomas Robinson, vice president, and D. H. Mueller, assistant cashier. The first capital stock was $12,000; this was raised to $25,000, and on June 20, 1913, was again raised to $35,000. There is a surplus of about $10,000 and the average deposits are $200,000. 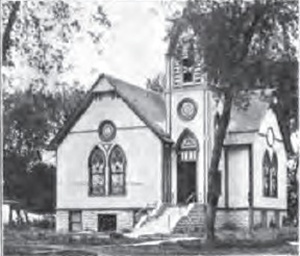 The new building was occupied by the bank on August 1, 1914. There are sixteen stockholders at the present time. The bookkeepers are Mabel Chestnut and Carrie Anders. The Adair Reflector was a six-column folio established at Adair in the spring of 1874 by Charles Stuart. The first issue came off the presses May 28th of that year. This paper ran for several years and then was abandoned. The Adair News was established in the spring of 1882, the initial number making its appearance on March 17th. G. W. Wilkinson was the proprietor of the paper, and the office was located over Moran's store. The subscription price at this time was $1.25 per year. 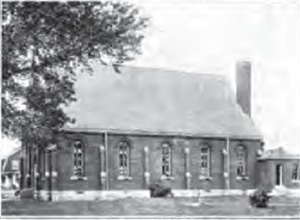 Adair was then not incorporated, being a part of Summit Township. The paper was a four-column quarto and the pages were 8 ¾ inches by 12 1/3 in dimensions. In 1889 the News passed into the hands of J. B. Richardson. On July 5th of the same year the plant was sold to Charles C. Pugh, who later was associated with W. C. Pugh in the ownership of the paper. F. Kingsbury was the next owner and editor of the paper and sold it to J. W. Kitch on August 11, 1892. On May 8, 1896, G. L. Gillies bought the paper and became editor and on January 1, 1897, A. P. McDowell bought the plant. On January 1, 1906, Roy A. Stacey purchased the News from McDowell and is in present charge. A new building was completed May 1, 1915, and the paper is now located in probably the finest country newspaper office in the State of Iowa. The building is 70 by 25 feet, with ornamental front, four columns being used as shown in the picture. The press room is well equipped and the presses and other heavy machinery are placed upon cement bases to insure rigidity and non-conducting of sound and vibration. The windows are of steel with ribbed wire glass. The cost of the structure was approximately $4,000. The present circulation of the News is 1,200. In the spring of 1875 Heacock & Delaney erected a mill in the vicinity of the town. They operated this for a time and then were succeeded by Delaney Brothers, and in 1879 it was purchased by Frank L. Gordenier and W. R. Turner. In 1881 Gordenier bought the Turner interest and took in as a partner his brother, S. L., on April 7, 1883. In September, 1873, Charles Stuart commenced the erection of an elevator at this place. He put this under the charge of Fran Arnold. In the fall of 1874 D. S. West constructed a hotel which was known as the Adair House, but which was afterwards burned to the ground. In the spring of 1875 P. Luckinbill built a hotel which was called the Bear Grove House, which he ran until he sold out to Thomas Rodda. This latter host ran the place for a time, then sold out to Doctor Johnson, who leased it to John J. Irving. In 1878 it passed into the hands of John J. Richardson. It was then known as the Commercial House. Laban North built another hotel in the spring of 1874, which was called the North Star Hotel. Poor business compelled the closing of the doors of this place. The Reynolds House was erected by Hiram N. Reynolds in 1883, at a cost of $3,000, and was a first class establishment for the day. The postoffice at Adair was established in the spring of 1874 and John E. Moran received the commission as the first postmaster. He held this position, having the office in his store, until October 21, 1881, when he resigned and Harvey Smith was appointed to his place. In the steady growth which has been the good fortune of the City of Adair there has been nothing of the boom variety. The town is founded on solid rock and its institutions, schools, churches, clubs and financial activities, as well as merchandise trading, are well organized. There is developing in the town in very recent years a civic desire for improvement which first had its fruits four years ago, in 1911, when the city water and electric plant was established. This is just the beginning of further improvements such as paving and sewerage and better curbing and walks. Being located on the main line of the Rock Island Railroad has a great deal to do with the success of the town as a shipping center. Quantities of grain and stock are brought in here to be shipped to the eastern markets. The White Way, a marked and improved highway from Chicago to Denver, passes through this town and was largely promoted by one of the enterprising citizens of Adair, Roy A. Stacey, editor of the News. Beulah Lodge No. 449, Ancient Free and Accepted Masons, was instituted on July 3, 1884, with the following officers: J. F. Wilkinson, worshipful master; James W. Moore, senior warden; L. M. Hawes, junior warden; John Jackson, treasurer; J. H. Henryson, secretary; J. E. Moran, senior deacon; A. M. Kibby, junior deacon; G. T. Hendricks, S. S.; R. K. Eby, J. S.; Joseph Raffensperger, tyler. Beulah Lodge, while under dispensation, admitted, passed and raised the following named brothers; J. S. Shaver, M. F. Stults, Thomas Fitzgerald, G. W. Henkle and Samuel Ewing. The original charter members were: Levi Clay, J. F. Wilkinson, L. M. Hawes, John Jackson, J. H. Henryson, J. M. Moore, W. S. Wishard, A. M. Kibby, J. E. Moran, R. K. Eby, G. T. Hendricks, H. W. Smith, J. H. Devault, Joseph Raffensberger, C. Pettitt. Summit Lodge No. 348, Independent Order of Odd Fellows, was organized and instituted on May 17, 1876, with the following charger members: D. W. Moss, C. H. Vancott, C. C. Washburn, J. H. Henryson, Samuel Ewing, James Campbell and J. K. James. The first officers elected were: D. W. Moss, noble grand; C. H. Vancott, vice grand; C,. C. Washburn, secretary; J. H. Henryson, treasurer; James A. Parker, P. S.
Adair Lodge No. 205, Ancient Order United Workmen, was organized and instituted November 17, 1879. The first officers of the lodge were: J. H. Porter, P. M. W.; J. H. Henryson, W.M., C.C. Washburn, G. F.; W. R. Turner, O.; D. L. Wilson, Rec. ; J. G. Watrus, Finan. ; C. Pettitt, Recv. ; D. H. Kingery, G.; J. J. Beebe, I. W.; L. Clay, O. W. The charter members of this lodge were: T. D. Lougher, H. P. Starr, John V. Brown, G. W. Dosh, D. E., Bancroft, J. C. Gearheart and W. C. Libby. Washington Post No. 135, Grand Army of the Republic, was organized on February 22, 1883, with the following comrades as charter members: D. E. Bancroft, M. Johnson, G. L. Blakeslee, W. L. Dinsmore, J. M. Howell, C. Pettitt, H. P. Starr, J. H. Porter, J. M. Moore, L. M. Hawes, C. C. Reynolds, G. M. Goforth, L. G. Hesser, John Kaufman, N. Hopkins, V. H. Wright, J. Breinerd. The following men were the veterans now living in the town and township: John Coddington, Joseph Raffensberger, Joseph Furstenberg, Martin Brennan, J. H. Elliott, Wes McDowell, Farnsworth, Powell, M. L. McManus, T. A. Whittam, S. H. Wark, David Hammond, A. D. Arthur, Dan Largent, W. P. Cowden, J. H. Porter, Frank Dutro and Elijah Brownlee. There are about twenty veterans buried in the cemetery at the outskirts of the city. On July 21, 1873, at a point two miles west of Adair, occurred a train robbery on the Chicago, Rock Island & Pacific Railroad. Some men, supposed at the time to have been members of the noted James brothers' gang, had been loafing around in the neighborhood, spending their time doing odd jobs for farmers or anything to make their presence appear an innocent one. On the day of the robbery they procured a rope and going to the point of the robbery they loosened the spikes in the ties and attached the rope to the rail without moving it. The rope they carried up a high bank, behind which they waited. About 8 o'clock the express came dashing along and just before the engine came to the loosened rail the latter was pulled away, and the train came to an abrupt stop with its nose buried in the bank. The tender was thrown upon the cab of the engine and the engineer, John Rafferty, was killed outright. The outlaws then descended from the bank and rifled the express car of money, jewelry and other valuables, making a haul of about $3,000, with which they successfully escaped. The conductor was slightly wounded by a bullet, but none of the passengers was hurt in any way. Levi Clay carried the message to Casey and was instrumental in starting a pursuit of the robbers. It was found upon investigation that the tool house of the railroad company had been broken open and the tools taken therefrom with which to loosen the spikes. The pursuit of the bandits was unsuccessful, as they reached the Missouri in safety. George Sisson, son of Azariah, in company with H. H. Blakesley, followed them into the latter state. The indications pointed to the fact that the men were members of the James gang. "The fire broke out in the clothing house of Myers, Schnier & Company, and spreading west and southwest, consumed the hardware store of Kelsey & Bodley, and the agricultural implement house of John Jackson. Eastward it communicated to the residence of William Inghram, the saloon of Charles Fisher, the livery stable of R. S. Pinkerton, the agricultural implement warehouse of George Ish, the dry goods store of E. Cate, and was at last checked in its progress by tearing down the building occupied by Henkle & Swart as a jewelry and furniture store. In regard to the losses it is estimated that John Jackson loses on his stock of agricultural implements about two thousand five hundred dollars. No insurance. Kelsey & Bodley, on building occupied by Jackson, $250, and on their own stock of hardware about two thousand five hundred dollars. They had an insurance on the stock about enough to cover their loss. James A. Parker, on the building occupied by Kelsey & Bodley, about six hundred and fifty dollars. Myers, Schnier & Company, on stock of clothing, boots and shoes, about two thousand five hundred dollars. The stock was entirely destroyed, but entirely covered by insurance. William Inghram lost on restaurant building, stock and fixtures, and building occupied by Myers, Schnier &Company, about one thousand six hundred dollars. Two show cases, with their contents, were all that was saved from his stock. No insurance. Charles Fisher lost on his saloon fixtures about four hundred dollars, on which he had no insurance. Mrs. J. Reimers, who owned this building, places her loss at $600, and also was without insurance. R. S. Pinkerton on his livery stable lost about eight hundred dollars. The contents were all saved except about one hundred fifty dollars worth of feed and trinkets, covered by insurance. George Ish reckoned his loss on stock at $500 and had no insurance. The building he occupied was owned by C. M. Myers and caused a loss to that gentleman of $250, which was without insurance. E. Cate's stock of dry goods was all saved, but in a damaged condition, causing him a slight loss of about one hundred dollars, also without insurance. J. W. Dowdall, on the building occupied by Cate and on household goods, incurred a clear loss of $1,100, as he had no insurance either. 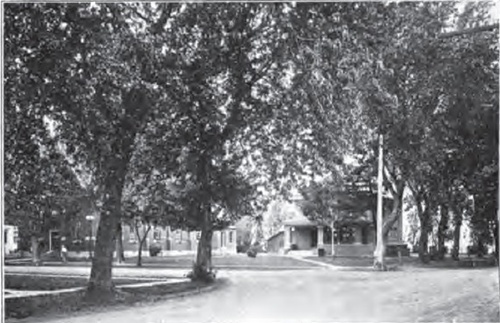 The building was a two-story one and the upper part was occupied by Mr. Dowdall as a residence. Henkle & Swart, on their stock of furniture, lost about four hundred dollars, not insured. A. Krundiner owned this building and put his loss at $600, with an insurance of $400. John Sheran's stock of groceries and dry goods was carried out and badly damaged, probably to the extent of $300, which was fully covered by insurance. M. Dunkin lost about two hundred dollars by the damage sustained by his drug stock being carried out, with no insurance. "The cause of the fire is not known, but is thought by all to be the work of an incendiary, as ten of the citizens had passed there on their way home from council meeting and a session of the township trustees, not fifteen minutes, at the most, before the whole of the building was in flames, and they had not discovered anything in the shape of fire, and, as it was a very dark night, the smallest light would have been seen. If it had not been raining at the time and a strong wind from the northeast blowing, there is no doubt but that the whole of the business part of the town would have been burned to the ground. As it was, it was only by the superhuman efforts of the citizens that it was saved. The Larson Building, the Sheran Building, the meat market, Odd Fellows Hall and M. Dunkin's drug store were in the line of the fire and only a vacant space of about ten feet remained between the furniture store and the Larson Building, and here it was by hard work the furniture store was pulled down and the fire checked. The fire was first discovered by Frank Kingsbury and Charles Fisher, but which saw it first is hard to determine, as they raised the alarm about the same time. Miss Belle Kelsey, who was staying at John Shaver's, was one of the first to be aroused by the portentious cry of 'Fire!" and through rain and mud, with but one shoe on, she went from one end of the town to the other, spreading the alarm. The ladies took hold and worked in saving goods and carrying water, and it was with their aid that a large quantity of goods was saved. The residence of R. S. Pinkerton, just south of the burned district, was set on fire several times by burning brands, but was extinguished before much damage was done."